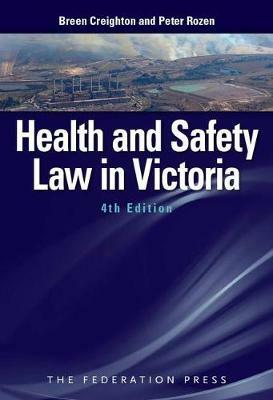 This is an entirely re-written and greatly expanded edition of this standard text on occupational health and safety law in Victoria. As with previous editions, it contains a detailed examination of the principal OHS statute in Victoria – the Occupational Health and Safety Act 2004. It also describes and analyses relevant aspects of other legislation which impinges on OHS regulation – such as the provisions of the federal Fair Work Act 2009 dealing with protection against victimisation because of OHS-related activity and right of entry to workplaces for OHS purposes. Like its predecessors, the new edition makes extensive reference to OHS law and practice in other jurisdictions, and to relevant international labour standards, notably the International Labour Organisation’s Occupational Safety and Health Convention 1981 (No 155) and Promotional Framework for Occupational Safety and Health Convention 2006 (No 187). Critically, the new edition locates the 2004 Victorian Act firmly in the context of the harmonised work health and safety regime which is enshrined in the model Work Health and Safety Act. Despite the fact that the Model Act was clearly based on the Victorian legislation, and is in force in most Australian jurisdictions, successive State Governments in Victoria have refused to sign up to the harmonised system. The authors clearly recognise, however, that it is impossible to understand or to apply the 2004 Act in isolation from the harmonised system. This is reflected in the inclusion of a lengthy chapter describing the evolution and substance of the harmonised system, and in the fact that all provisions of the 2004 Act are cross-referred to the parallel provision in the Model Act. Consequently, the fourth edition of Creighton & Rozen provides a valuable guide to the origins and substantive provisions of the harmonised legislation, as well as a detailed analysis of the Victorian system. The High Court in Deal v Kodakkathanath  HCA 31 has taken an expansive view of the Occupational Health and Safety Regulations. In light of this case, this new edition of the book contains an expanded discussion of the civil breach of statutory duty action under the Occupational Health and Safety Regulations 2007 and 2017 which will be of interest to practitioners involved in work-related personal injury litigation.